Inex has its headquarters in a positive energy building from a major renovation is now a in real time measurement tool . This unique building with many temperature sensor, humidity, monitoring of electricity consumption, lighting, photovoltaic production, weather station, a storage … intersaisonnié allows engineers to compare the results from design studies to actual use of the building. Our extensive experience in the field of building allows us to develop internal micro-software for performing calculations sharp and promoting automation. Today, we have a series of tools allowing us to calculate the simple loss to the sizing of the hot power pool basin. Keen to maintain its excellence in the field of construction engineering and the environment INEX accompany the technological revolutions . Today this means the development of a design office thermo-ventilation specializing in CFD and the generalization of the BIM within design teams. BIM, or digital model is a digital file that concentrates all technical information from a book. In this context, the design of systems (HVAC, electrical and plumbing) is based on a shared digital model by all project stakeholders. The expertise of INEX is based on a team of designers and engineers in the design and BIM project management. For each project a computer engineer supports the BIM manager during updates of the model and in the creation of a dedicated server. Inex uses software REVIT MEP which specializes in network design and that was developed specifically for BIM design. The integration of this tool allows facilities exchange between different software to perform specific studies (Study Regulatory RT2012 – STD – CFD) from the model. The expertise of INEX is based on a dedicated team and composed of designers and engineers in the design and BIM project management. For each project a computer engineer based BIM manager during updates of the model and in the creation of a dedicated server. BIM manager is the guarantor of the integrity of the model and design. Generally actor of the project and cross-training, prepares and oversees the various phases of content integration in the collaborative model. He is the main contact at the working groups on the BIM model. The designers where BIM modelers provide daily task of modeling BIM model in accordance with the procedures and methods implemented by the upstream BIM manager. engineers are the designers, they verify and integrate the technical content: they are the guarantee of the specific information contained in the different blocks. They used the model for synthesis and their calculations. BIM Promotes Closer cooperation from the preliminary phases of a project and allows, through the simulation to study Many scenarios for energy optimization. INEX integrals the simulation tools to dynamically analyze the impact of design choices on energy consumption. 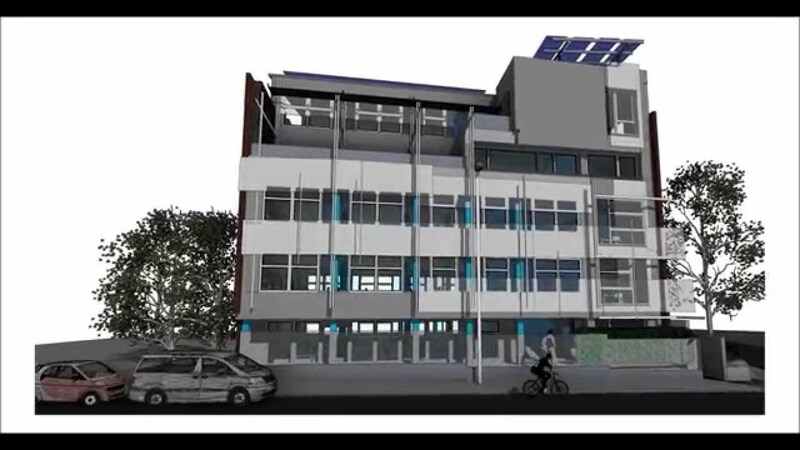 Building orientation, compactness, type of wall, glass surfaces, shade and shadow are essential Elements generated to calculate the energy consumption and Can Be Directly Extracted from BIM. INEX optimizes the use of 3D models for simulations via ict use as a gateway to icts specific simulation software and trade and NBDM gbXML file. The integration of this tool Facilitated exchanges entre different software to accomplish achieve specific studies (Study Regulatory RT2012 – STD – Heliodons – CFD) from the model soon APS phase. INEX integrates BIM approach for several years to meet the customer expectations on numerical modeling. BIM, or digital model is a digital file that concentrates all technical information from a book. In this context, the design of systems (HVAC, electrical and plumbing) is based on a numerical model shared by all project stakeholders. Inex uses REVIT MEP software that is specializing in network design and that was developed specifically for BIM design.